Michael Alpert is a founding member of Brave Old World and a researcher of eastern European and Jewish music and dance. Walter Zev Feldman is the author of works on the literatures of the Middle East and Central Asia and a pioneering scholar and performer in the klezmer "revival" movement. Marion Jacobson is a doctoral student in musicology at New York University and is completing a dissertation on Yiddish folk choruses. Barbara Kirshenblatt-Gimblett is professor of performance studies at New York University and the author of numerous works on eastern European Jewish culture. James Loeffler is a doctoral candidate in Jewish history at Columbia University. He has been a research associate at the Jewish Music Research Centre in Jerusalem. Frank London is a founding member of The Klezmatics and of Hasidic New Wave and has produced an extensive body of work in live and recorded music and film music in the United States and Europe. Hankus Netsky an instructor in jazz and improvization at the New England Conservatory and is the founder and director of the Klezmer Conservatory Band. Robert A. Rothstein is professor of Slavic and Judaic studies and of comparative literature at the University of Massachusetts, Amherst, and the author of works on the linguistics, folklore, and popular culture of eastern Europe. Henry Sapoznik is the head of Living Traditions, which sponsors KlezKamp, which he founded, has authored two books on klezmer, and was a charter member of Kapelye, a pioneering "revival" band. Mark Slobin is professor of music at Wesleyan University and the author and editor of books on the musics of Central Asia and the eastern European Jews in Europe and the United States. Alicia Svigals is a founding member of the Klezmatics and of Mikveh, and composes and collaborates in many music and theater projects in the United States and Europe. Klezmer, the Yiddish word for a folk instrumental musician, has come to mean a person, a style, and a scene. This musical subculture came to the United States with the late-nineteenth-century Jewish immigrants from Eastern Europe. Although it had declined in popularity by the middle of the twentieth century, this lively music is now enjoying recognition among music fans of all stripes. Today, klezmer flourishes in the United States and abroad in the world music and accompany Jewish celebrations. The outstanding essays collected in this volume investigate American klezmer: its roots, its evolution, and its spirited revitalization. 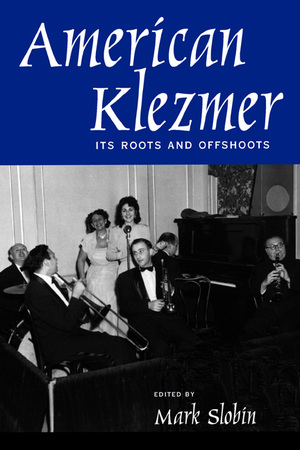 The contributors to American Klezmer include every kind of authority on the subject--from academics to leading musicians--and they offer a wide range of perspectives on the musical, social, and cultural history of klezmer in American life. The first half of this volume concentrates on the early history of klezmer, using folkloric sources, records of early musicians unions, and interviews with the last of the immigrant musicians. The second part of the collection examines the klezmer "revival" that began in the 1970s. Several of these essays were written by the leaders of this movement, or draw on interviews with them, and give firsthand accounts of how klezmer is transmitted and how its practitioners maintain a balance between preservation and innovation. Mark Slobin is Professor of Music at Wesleyan University and author of several books on Jewish and Central European music, including Tenement Songs: Popular Music of the Jewish Immigrants (1992) and Exploring the Klezmer World (2000). 5. "All My Life a Musician"